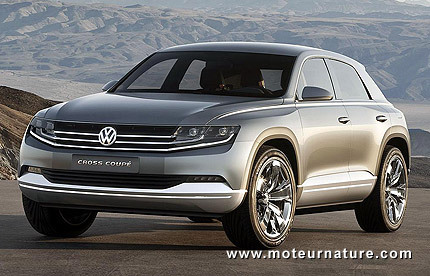 4 months ago in Tokyo, Volkswagen introduced an interesting Cross Coupé concept, a sleek and compact SUV. That was the silver model on the left. The beltline is a bit high, as is the ride height, but it looks much more like a sedan than a SUV. As you would expect from a vehicle this size, fuel economy won’t scare anyone, especially with the smooth plug-in hybrid Volkswagen had developed. With a gas engine and 2 electric motors, there are 262 hp under the driver’s right foot. Top speed is a moderate 124 mph, but fuel economy is an excellent 87 mpg, according to official European testing, which is particularly lenient for plug-in hybrids. CO2 emissions are 99 gram per mile. 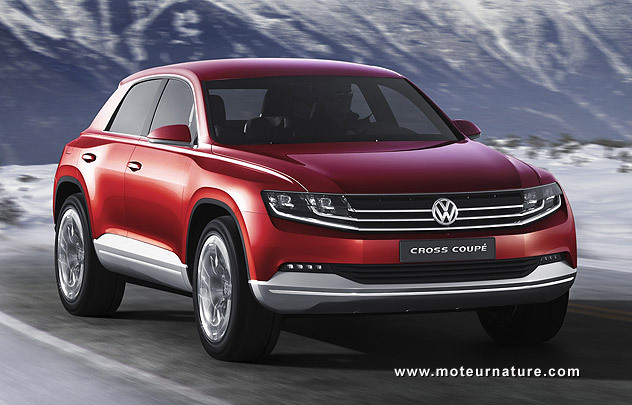 Now the news, Volkswagen will do it even better for the Geneva motor show. That will be the red car above. The gas engine is gone, there is a diesel instead. Power is up, to a strong 302 hp, as top speed, to 136 mph, and so is fuel economy, to an exceptional 131 mpg, with CO2 emissions of 74 gram per mile. We don’t a have all the details yet (they will be released at the show), we wonder about the car’s range on its battery, but one thing is sure: this Cross Coupé is much more than a pretty face with a smart brain. There will a production derivative.